As with any training, recall is all about putting a routine into your dogs day which he enjoys taking part in. Recall should never mean “if I run back to my owners, she’ll put me back on leash” but always, “if I run back to my owner, it’s usually worth my while”. With adult dogs, all recall training is easier done using a long line, which is dropped on the ground & dragged behind the dog. Never go from a short leash, to no leash. Instead use a long line which gives your dog freedom, without you losing control. Here is my quick guide to recall training, both for use with young puppies & older, more routine established dogs. First, pick a recall command (not your dog’s name) and only use it when the dog is either running towards you, or can be enticed towards you because you are worth running to (what reward are you offering?). Start all training in a low distraction environment such as your house and/or garden. Only call your dog to you when you are sure he will come back, or you can bring him back or go to get him. Don’t waste your recall command, no point in calling if he’s ignoring you. Always make it worth your dog’s while to come back to you, at first using food or his favourite toy. Surprise him with the reward, sometimes use his boring food kibble, sometimes using real chicken, liver, hot dog, cheese. Always keep him guessing & deliver the reward in a fun way. Don’t just push it into his mouth. Toss it, drop it or roll the food/toy. When first training recall on a long line, give & expect 100% attention. This means that even if he’s only on the long line for 2 minutes, during this time you are playing with him. This way, he’s really paying attention to you & enjoying his time as the most fun he has on a walk. If you cannot watch your dog, he should be on a short leash. Invent games to keep your dog thinking “it’s always worthwhile to check in with mum/dad”. Any voluntary engagement by the dog should be rewarded. Use tasty treats & toss or roll them on the ground. Take out his favourite toy & play for a short period when he’s not expecting it. Drop some food then quickly run away calling his recall command. When your dog catches up, drop some more food & run away again. Teach your dog a range in which to stay while walking off leash. When he’s reaching the end of his long line, give a command such as ‘this way’, then stand briefly on the line before immediately changing direction. This teaches your dog to watch you, as you’re unpredictable & he may loose you if he doesn’t keep an eye on where you are going. When you’ve done this a few times, begin to change direction without saying anything, always rewarding your dog when he catches up. Teach your dog that the quicker he comes back, the quicker he’ll get to resume what it was he was doing before you called him. This improves speed of response & enthusiasm & means you don’t always need to use a food or toy reward. 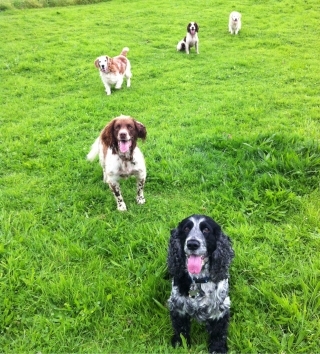 The quickest way to teach a dog not to come when called, is by allowing him to run up to & play with every dog he sees. This is confirming in his mind that you are less fun than other dogs who are always worth investigating. This is also the quickest way to get your dog beaten up by other dogs. When you see another dog, always teach him to sit & not leave you until you release him. Remember just because your dog is friendly, does not mean the other dog is. It is my belief that if your dog does not have a reliable recall, regardless of the distractions present, he simply should not be off leash. Thankfully, it’s also my belief that every dog can be taught a reliable recall so that, where appropriate, they can run free. This is, afterall, the biggest reward you can give any dog.